"Blossom" was a marked change in direction and a deliberate understatement in reply to "Suff". We also wanted to capture our feelings during that slim period of the year when spring and summer merge into a perfect paradise of optimism for the coming summer. This album is particularly special in that it occurred at a time when were happily naive and falling into, what we saw as, a bright future. We had been pushing hard for about 4 years, writing, gigging, promoting, making movies, and putting our own light show together - slowly growing, building a fan base, a business, our machine. Releasing "Suffocating" in November of 1992 was big for us. It was more - more flowers, people, and costumes. I wrote in my journal after that release party that, "it was good to be the kings." Over the next few months we kept the machine moving forward. We were making new contacts, playing new cities, going back to our old haunts reasserting our brand of rock. It had been a heavy 4 years. After the winter of 1993 we were finally starting to see our hard work pay off. Our collective mood was to write something acoustic and light-hearted to celebrate both our success and the fact that spring had sprung. On the actual writing and recording of "…and Every Blossom" I have only a snapshot in my head. I'm sitting in the balcony in the auditorium of Germantown Academy. The band was working on Blue and Sand while I worked on the words. Those words turned out ok. The original words for Ballet for a Marsh however did not stand the test of time. I stole from myself to make the song stronger. We changed the approach from a "Mallard and Swan" to "Man and Woman." The former was definitely less hooky. It was a time for celebration for sure. In less than a month after "Blossom" was released representatives from Sony were in our studio to talk the talk. That's my story and I'm sticking to it. 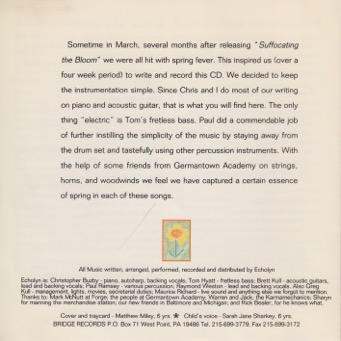 "...and Every Blossom" was a time, place, and space in our lives as a band where we were riding a torrent of success from the recent release of "Suffocating the Bloom" in the fall of 1992. Subsequently, our creative juices were churning-out new music faster than we could control. Collectively we decided it would be great to write something fresh, acoustic, and spring-like to capture the moment of song-inception. We also knew it would showcase a very different side and style to our writing process, as most of our "electric" songs often started acoustically on piano and/or guitar ~ a side of our songs and songwriting process our fans/listeners rarely got to hear, see, or experience. To prepare for the Germantown Academy recording sessions (GA was my HS Alma Mater and where I was currently teaching High School Band/Chorus & Music Theory as we were writing this album) I remember sitting in my parents living room at my great-grandmother's Wurlitzer spinet piano (handed down to my grandmother, then handed down to my mother and then used by my brothers and I for piano lessons, all from age 5 throughout high school) with Brett sitting on a chair next to me with his acoustic guitar, writing and finalizing the chord progressions, melodies and arrangements to what would become "Blossom's" 4 tracks. 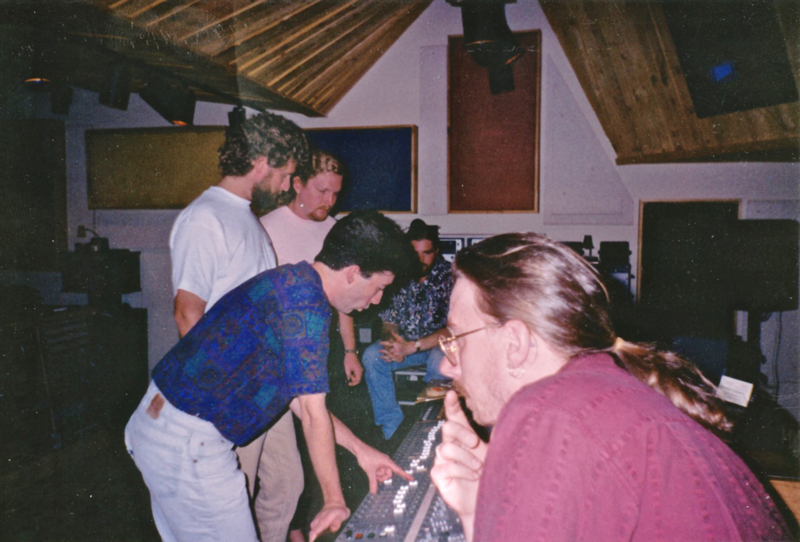 Once the basic tracks were complete I started scoring saxophone and string parts for my colleague Dainis (multiple winds) and student strings (Jeffrey, Nancy) and winds (Evan, Dorothy and Alex) to play and record at the GA sessions. We used GA's large auditorium for the recording process to capture the acoustics of a large concert hall (450+ seats) - allowing me to also play and record my piano parts on the 9 ft. Baldwin baby grand piano that resided in that space. As a young arranger and composer, fresh out of college, I distinctly remember both the joy and frustrating challenge of hearing parts in my head that were often harder than the instrumentalists could play, and needing to take multiple takes and attempts to record them - occasionally even rewriting parts on-the-spot so the original musical ideas could still speak in the way they were intended, adding to the overall multi-layered textural concept of the album. That type of "learning on the fly" as a composer/arranger absolutely helped me cut-my-teeth for the arrangements I would eventually write for the "As the World" sessions - with a Sony recording budget that allowed us access to members of the Nashville Symphony, featured prominently on the album tracks "Always the Same," "Entry 11-19-93" and "Never the Same." Great lessons learned, indeed. The 4 acoustic songs on "Blossom," to my ears, are perfect examples of how most echolyn songs are created: organic, textured and rhythmic, with strong melodies and often complex harmonic structures. All 4 also spontaneously capture how we came to, and continue to, craft and create a style of music as a band that is all our own. While I love all 4 tracks on this release, the two tracks I still have the softest-spot for are "Ballet For A Marsh" with its churning polyrhythmic percussion track behind the sparse song orchestration and "Blue and Sand," one of Ray's finest moments as a vocalist, IMHO. On this, our 25-year anniversary of this EP release, I hope you'll join us in celebrating the gift of music that keeps on giving by indulging in and cranking-up these uniquely beautiful songs ~ welcoming the summer season back into our lives, more once more. An important time for us as a gang. With "Suffocating" released around Thanksgiving, we slid into the holidays satisfied but hungry, probably pondering the new year, 1993. A lot of acts were presenting themselves acoustically about then, and although this trend may not have significantly influenced echolyn to be a bit more "basic", it did put us in step with the unplugged revolution. I think "Blossom" showcases the band's songwriting ability, great melodies, harmonies, and some interesting sounds, e.g. more "winds, wood and wire". I remember being in a position, entering 1993, where we felt we could pick our venue, our date, and set goals that would help us grow, prosper, and maybe get somewhere. I have fond memories of working at Germantown Academy. I was sculpting then, and still painting. The artwork for "Blossom" was quite simple but meaningful. Whenever I am low, or worried, I envision a hill, a sunny hill, one with a bunny on it. I put that hill, with a child's hand, on the cover. Twenty-five years is a blink, a blur, and a poignantly big chunk of one's life. Here are a few twenty-five year-old memories related to "Blossom." Echolyn was growing in popularity very quickly in 1993. We had become a damn good live force the year before and were still getting better because of the variety and amount of shows we were playing. We started getting recognition from beyond of our home state and better yet our country because of our stage intensity - as well as the positive reviews of our two preceding albums (from 1991 and 1992). We all seemed to be operating with a mission, pistons firing. My brother Greg was getting press and gigs for us while expanding our network of industry connections. We all hung out and worked together in about as good a harmony as six people can - come to think of it, three of us lived together back then! We saw a lot of each other! Our designed snowball effect was building and the six of us were making a push to see how far it could go. I remember in early 93 having a sense of songwriting momentum from the previous album - "Suffocating the Bloom". I personally wanted a slight detour from what I knew would become our 4th album - "As the World." I knew we would get to that album at some point (the songs were already starting) but thought it would serve that music and our creativity to try something short, spontaneous, and different before diving into another full-length project. I wanted an aside moment to pause from where we were heading. That aside was "…and Every Blossom." It should be pointed out that the in the months leading up to and following this project we were playing gigs four to eight times a month and rehearsing constantly to stay sharp. We only slowed down during the actual recording process in May of that year. I know Greg and I saw each other every day working on various goals. It was non-stop! I used my 16-track tape machine for all of this. The new updated mixes (available since 2002) have been mixed directly from the original tapes. For me, the recordings mark the first time I started to finally record better sounds (given what I had). The songs themselves are singularly unique. They are different than what we were doing at that time- and even now they stand alone. When I hear these tunes they feel as if I'm visiting another place and time, yet like home. They are harmonically rich and always moving somewhere else. My lyrics are naïve, my lead voice still not my own, my creativity still not refined, but all - unabashedly - a process and progress for me. Chris does a lovely job with the string, horn, and woodwind arrangements. Just perfect. Tom's fretless bass ideas add a nice touch of tonal ambiguity and uniqueness. The album came out on June 18th. We played the Chestnut Cabaret in Philadelphia to celebrate. It was an excellent show that I remember to this day. Interestingly at this show we also played songs that would eventually be on our next album. "As the World." The ideas were indeed flowing that year (all of "As the World" and "Blossom" were written in 1993). Less than a month after the June 18th release party we did a showcase for Sony Music at our studio (July 7th) and were offered a recording contract that would ironically be our penultimate moment while simultaneously marking the beginning of a slow disintegration of the idyllic efforts driving that stage of our lives. Weird huh? 1993 was really the Roman candle salute and last fanfare marking our DIY four-year unified effort to win the world. It was our "off to the front and over the top" moment! Everything changed after that year. We had many amazing adventures in 1994 and 95 but never to the unadulterated grand idea of 1993. Maybe we grew up, lost our naivety, or idealism? I don't know. After 93 I felt like we had lost something in order to win the war. "Blossom" is our acme moment of idealism, romance, and youthful exuberance from our first phase as a band. I hear it in the music and words. I listen to Ray's lyrics on Blue and Sand. There is a real optimism witnessing the potential of spring and summer…and our band, "To reach, to grow as high as elephant's eye." I think that sums up and crystallizes what we reached for and how we felt that year. At my age now, thinking of 1993 and the music we wrote puts a smile on my face and yet makes me sort of sad. I guess the cliché to use would be bitter sweet? So it goes.